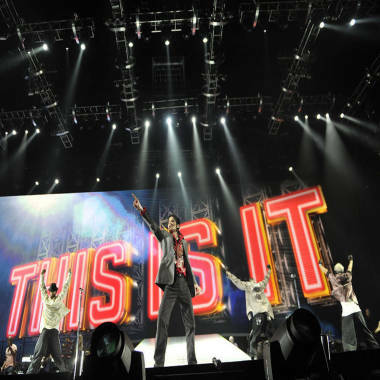 Michael Jackson in 2009, rehearsing his "This Is It" tour. This is it: On Monday, the wrongful death civil trial pitting members of Michael Jackson's family against tour promoter AEG Live is set to begin in Los Angeles. Depending on any number of legal factors it could end up being a long slog, dipping into the darker side of fame and celebrity. But one thing drawing attention right now is who could take the witness stand -- given the Jackson family legacy its no surprise the list is lengthy, and star studded. Currently, there are 97 possible witnesses for the plaintiffs and 113 for the defense (though overlap is likely in some cases), according to the Los Angeles Times. Dr. Conrad Murray, whose actions (or lack of thereof) precipitated Jackson's death could be a key witness on the stand -- if he speaks. As noted on TODAY last week Murray, now serving out and appealing his sentence of involuntary manslaughter in Jackson's death, is likely to take the 5th. Jackson's mother Katherine has already been deposed; his son Prince and daughter Paris are likely to to discuss Jackson's final hours on the stand. Katherine, Michael Joseph "Prince" Jackson, Paris Michael Katherine and Prince Michael Jackson II -- aka "Blanket" -- are are the plaintiffs in the case. The plaintiff's witness list also includes director Spike Lee, bodybuilder and "Incredible Hulk" star Lou Ferrigno, music producer Quincy Jones, longtime Jackson family friend and singer Diana Ross and Jackson's ex-wives Lisa Marie Presley and Debbie Rowe. "Purple Rain" musician Prince has also been named as a potential witness. Ferrigno was initially enlisted by Jackson to help him get in shape for the "This Is It" tour, as People noted, something the muscleman had done for Jackson in 1994. "Being 50, his body went through a lot of stress getting ready for the tour, but he was awesome," Ferrigno told People back in 2009. It seems likely that as his personal trainer, Ferrigno will have a first-hand opinion about Jackson's fitness. Jones was a long-time friend of Jackson's (as well as a producer of albums including "Thriller" and "Bad") and hinted to Details after Jackson's death that what killed the pop star was as much psychological as physical: "I'm a musician. I'm not a psychiatrist. I would think that the pressure of the concerts and the debt and everything else.... I know that Lisa Marie Presley said she always thought was going to die like Elvis. You sit and think about that stuff, it'll happen to you." What other celebrities may contribute remains murkier. Ross was next in line after Jackson's mother to be the guardian of his children, though there is no indication that she had any specific knowledge about his death. The singer Prince might seem to have been Jackson's sons' namesake, but reportedly that's an old Jackson family name. Spike Lee has directed several projects related to Jackson, including 2012's "Bad 25" documentary and two music videos for the singer's 1996 "They Don't Care About Us" song. The trial won't be televised, which may dial down the circus factor -- but this is Hollywood, and Jackson remains nearly as iconic a draw in death as he did in life.